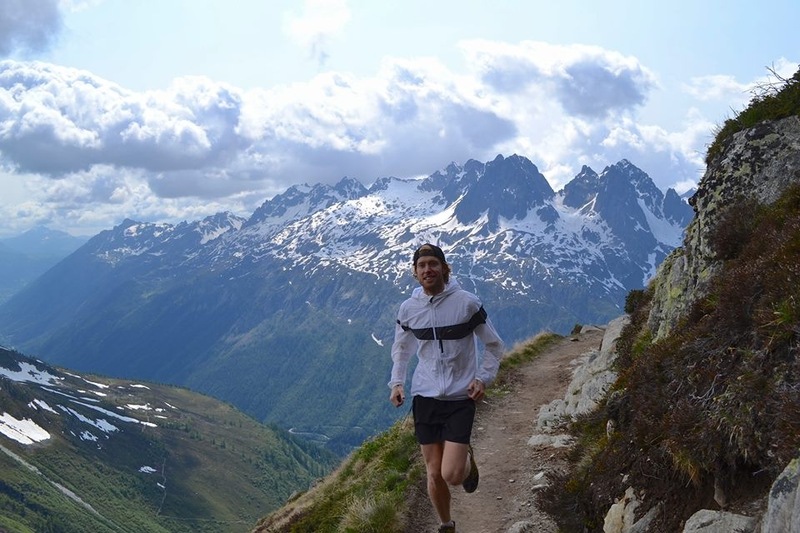 Running for La Sportiva Mountain Running Team in Chamonix, French Alps. Fleet Feet: Where did the idea for Run Bum come from? Run Bum: It’s a funny story. I used to tell people I was a professional runner bum when they asked me what I did. This was because I was embarrassed to tell people that really I refereed soccer full time, lived at home and blew all my money on traveling the world to run. I told this to a guy I was playing soccer with one day and thought nothing of it. The next week he came up to me and said "DUDE! YOURE THE RUN BUM!" I laughed at first and then he told me about the idea and we started Run Bum with the vision to inspire people, sell shirts and stickers, and travel running. Then I branched out a side gig and started putting on scenic trail running races. FF: When did you realize running was such a passion? RB: I've played soccer since I was 4 yrs old and haven't stopped. In high school we laughed at all the XC runners in their short shorts. Why would someone run for fun? It was our punishment. However I was always the guy at the end of practice saying hey guys let’s keep playing or lets go run a lap or two. 5 years ago I started running because my mom was injured and gave me her Peachtree number. Let me tell ya, Alicia Blanton has never run so fast. HA! I ran like 42 or so minutes on no training and was really upset. I was zig zagging through a bunch of people walking/complaining. I got done and told my mom my time. She was amazed to say the least but I knew I could go faster. She encouraged me to qualify for next year’s run at some other 5k/10ks. So I started running sporadically. I am sure it was like a 6 yr old running. You know, dead sprint until they can’t, die, recover, and repeat. I could never break 20 mins on a 5k or 40 minutes on a 10k. So I decided if I can’t go faster I will go further and there it began. FF: Of all the places you've run, do you have a favorite? 1. Chamonix, French Alps. Home to the Ultra Trail du Mont Blanc (aka the world cup of mountain ultra-running). It also contains hundreds of miles of single track trail all accessible out your door. 3. Maui, Hawaii. I love running Skyline Trail on Haleakala... Google it! 5. Nepali Himalayas. Nepal is amazing. I can’t begin to describe it so I won’t! Yak cheese and beer at 15,000 ft are a crazy time, just saying. FF: What drives or motivates the run bum? RB: from my random ADD mind... I really want to always get faster. I love running fast and doing crazy stuff. Anytime I feel uncomfortable or afraid to do something then I want to go do it. I like to face fear and challenge head on. Above all I do not listen to others when they tell me what I should or shouldn’t do or who I should or shouldn't be. I look up to A LOT of people and I want to in return be someone who inspires. Everyone needs someone to look up to and someone to look down to. I don't want people to look up to me because they think I might be "faster" or do crazier stuff, because I am not, but because I follow my heart and don't let ANYTHING come in between. There are 3 types of people in this world. People with no passion, people with one passion and people with a passion for life. I am the latter. I strive to do it all, see it all and try it all. Food, running, sites, countries, sports etc. My thoughts are summed up like this. Life is about compromise. If you compromise with your dreams they will always be dreams. People start compromising on small things and before they realize it their life is over and they are half empty and have some many stones left unturned. Life isn’t about money, a job, a suit, social status, or material things. It's about friends, family, and achieving true happiness. DO EPIC SH*T! FF: If you could plan the ultimate race, what would it entail? RB: Yaks, river crossings, paintball, skydiving and Ice T (think most dangerous game). With all the races I put on, I want them to be different. Anybody can put some race in the woods. YAWN! I want you to see things that will expand your mind. Sky to Summit 50k/8.5m is the perfect example. Everyone told me after the race that they had NEVER see something this beautiful while running. This made me smile. FF: How has running impacted your life ? RB: It’s been a HUGE confidence boost; it’s made me cut down the heavy drinking, and redefined who I am as a person. I never consider myself a runner because it is not who I am, it is something I do from time to time. Example: You meet someone and they say hey I am Joe the Lawyer or hey Joe what do you do and they say I am a lawyer etc. They define themselves by their job or rather let their job define who they are. This is why running has put me in the position to define my own life. When people ask me what I do there is no simple answer. Running has been so great to see amazing places, meet amazing people, and eat amazing food. I cannot tell you how humble it has made me. If you have problems in your life write it down and think about it for 30 minutes. Then go run until you break all your emotional barriers down. Pick that paper back up and re read this. You will usually find that you let go of all emotion that was hurting you before. I really now have a more Zen approach to life because of running. I looked at running as pain and work before. Now I look at it adventure and freedom. I also try and do 1-2 charity runs a year. Feb 22nd I will be trying to see how many summits (up and downs) of Stone Mountain I can do in park hours. FF: So you have run bum tours. What sets them apart from other running trips? RB: This isnt a tour as much as it is following me on a 6 day adventure. I have run and traveled all over the world. I strive to see the most beautiful things. I take folks on 5 night/6day tours. This is a no holds barred tour. It’s all about the scenery, not about pace or mileage. This past summer was the first tour in the Canadian Rockies. It sold out and we had a blast! On day one people's minds were blown. I cannot describe how amazing these tours are. Lots of the trails we do are off maps and locals only stuff. So this is not a guided tour where you see tons of people. The group, me and a van. BOOM! FF: What advice would you give a runner preparing for one of your races? RB: That really all depends. I now have everything from a 5k to the 68 mile Georgia Death Race. Not just for a race I put on but really for any race I tell people to make it fun! Running is and should be fun. if not its work. I see too many people with these CRAZY mileages and or pace training programs. Run how you feel and just be consistent. Ditch the Garmin, the watch and the phone and just go explore! Let’s take a 5k, half and the Georgia Death Race. For the 5k have fun and enjoy the atmosphere. ALL my races are about the entire weekend experience. It’s about the local area, food, beer, friends etc. So TAKE IT ALL IN! Half marathon- I will have 3 of these for 2014. Again it's all about the scenery. Bring a camera and don’t focus on time or mileage goals. You end up walking in trail races from time to time so just go out for an hour-90 min run hike here and there and enjoy it. For the Georgia Death Race... drive to the hardware store, purchase one ball pen hammer, take out of package and hit toes, feet, calfs, Achilles, knees, quads, hammies, hips, back, it band until in awful pain. Then go run 50k. Note if you cannot reach back please have friend hit for you. I am kidding. It’s tough yet beautiful. It’s NOT LIKE ANY other race I have. I want it to be hard, like 50% finisher rate hard. But with great difficulty comes great reward! The key to this race is practicing hiking up and running down. It's 68 miles with 37,000 ft of elevation change. FF: If someone wanted to find out more about your tours and races, where can they find this information?